Deep inside the ruins there lies a Labyrinth, it is so wide and deep that once you enter it becomes almost impossible to find your way out again. In different layers of the Labyrinth lies monsters of different shape and size. Their strength varies. Defeat the hydra and gain passage to the other layers. Note that the hydra boosts a skill of regeneration and so, if a head is cut off two more regrows in its place....thread carefully. Truly terrifying. If but to keep things simple, that would be the only way to describe my power as it is now. Feats like breaking down mountains, picking up giants, destroying sections of cities seems paltry now. I've gained so much strength that even meteors would crumble before me. I could reshape a landscape with a single punch, and would be questionable if any but the strongest could resist such terrifying might. Throwing something as heavy as the Antonov An-225 could be effective in combat, though almost hilariously easy. Growing stronger still, I find myself eating most attacks for breakfast. In fact, I don't even wake up unless it to face heavy blows. All else will likely just glance off unless reinforced somehow. Those fighting against me with strength alone will find themselves at a standstill unless they're stronger. At this level, I have gained a deep and very intimate understanding this are. Comprehending movement in all forms is astoundingly clear to me now. The extent of my capabilities is so great that most movements become a chore to keep up with, even for some masters of hohou. Furthermore, after ascending to this level I am now capable creating at most 10 clones of myself at once. These clones are indistinguishable from the my true self, mimic my movements, and are capable of lasting for an extended period of time. A silent blade yields no power. I have no cemented my place as someone of extreme constitution. I am capable of surviving even the most powerful attacks as if they were nothing. If attacked with Hakuda, the attacker would be more likely to injure themselves than me. Reiatsu attacks would seem to do little more than singe the skin, while, Zanpakutou would themselves barely able break the skin. The Minatour hails from Asgard, it wields the hammaer of Thor which has a high affinity for electricity and could also generate and transmit electricity. If spinner rapidly, it gives the Minatour the ability to fly at a godlike speed. The hammer nullifies all Kido which makes it the Shinigami’s worst Enemy. Thread with care or be killed. Being well above average in terms of endurance, I could definitely last all night long before breaking a sweat. A moderately high level of high intensity action would most likely slow me down. Nearing the peak of my skills, I am now recognized as a Grandmaster of the art. Grandmasters have gone beyond mere training and techniques. Their full understanding of the art's theory allows insights that no lesser artist could conceive. Their body reacts as needed or desired with little, if any, thought required for any situation. This is not to say that they cannot be surprised by a clever tactic, but it is unlikely to be as effective, if at all, a second time. In terms of power, a touch can have the force of a bomb, merely sever a certain nerve, or devastate an area. An expert encountering this level of skill would wonder what just happened. "Did I ever actually learn the equivalent of buttering toast?" Maybe the grandmaster put on a blindfold and split a thousand rabbit hairs floating on the wind before breakfast. Where they would sensibly use a butter knife to butter the toast, which might be made of experts. The Griffin is a mystical creature that lays its nest in the Labyrinth, it flies very fast but not so fast that a master cannot follow, its body is weak to attack but don’t let that fool you for it is a very experienced hunter. Having reached the average durability of a spiritually aware being, I can now be considered a being who's body has been trained or enhanced to handle blows of moderate strength or intensity and keep fighting. However, I can still be overwhelmed by sheer quantity of these attacks or the outright quality of a stronger one. I have now reached the master level. I have now proven myself capable of maintaining super-sonic speedsfor extended periods of time all while using the least amount of steps to achieve those movements. Further more I am capable of using closing or creating gaps, between myself and notably lesser opponents often before they are able to realize any movements were made. Additionally, my speed and reaction times are so great that even when hit I can retaliate almost immediately after making contact. Name :The Knight • Defender Of The Fortress Of Anaryea. Description/details/backstory : Defending the Fortress and Throne of Anaryea, eventually, he gave up the ghost in order to seal access to the throne. After the great fissure in reality; the Lost Ruin, the Knight resurrected to once more defend the Fortress from intruders. Expert no more, I am now recognizes as a master of the art. Masters are the best-trained in Zanjutsu. In fact, masters are so well versed in sword combat that most moves can be executed to devastating effect, leaving little option for defense to any who are not at least equal in skill. All of the basics and variations are applied with reflex-level spontaneity. Their understanding of the blade allows them to wield it to a greater extent than even their bare arms. Even a miss comes with enough precision graze the opponent's flesh. They know all of the art's theory and probably all of the advanced techniques, and begin to experiment with concepts to advance both. As a knight, once the opponent lays down his weapon, he acts upon the code of Chivalry and lays down his weapons too. This means that; the Challenger cannot use his zanpakuto, weapons or gauntlets but must rely strictly on his/her innate skill and Kido. As a past dweller of hell and having a link with he'll, he's able to conjure flames; Sheer destructive potency, constructs or ignitions for Explosion inducement.. When activated, the distinct change in his form is easily noticeable, the speck of smoke he breathes out, the sudden glimmering eyes and the somewhat scorched armor. Not exactly faster per se, however, each movement releases blaze of flames and strikes/swings/slashes/punches releases torrent of scorching flames. The change increases his strength and durability. When the armor is on, his defenses are boosted however, his speed and strength decreases by two levels. By enchanting 'uplift', his armor burns away, giving him full access to his hindered capabilities, reinstating his absolute condition. However, his durability drops by two levels instead. Okay @konami31 and @Akugaranwa Itachi, and @PhoenixDayne. This is an outline of how monster profiles will be set up. Phoenix already has it down. Monster profiles will essentially look like how he has it set up. Won’t have spoilers though (adding them in by default would be problematic). For stats there will be no reiatsu, reiatsu control, or zan mastery. Reiatsu will be unlimited for all monsters. And their control will be perfect. This is mainly because they’ll be limited to normal attacks and 4 special attacks. However Monster / NPC stat grades will be starting at a minimum level of E+ and will be max level 100 for now. However probably avoid going beyond level 60. I will, however suggest that you also make the majority of monsters right now in the level 25-40 range. [mentiom]XIII[/mention], I am working on a new project on this "lost trial" stuff. I intent to create a new realm or secret cave in the lost trial dimension whereby four(4) tier monster level characters are settled. Adventurers can choose the levels or tier they wish to conquer and get rewarded with gears and heritage abilities. Of course, i have some ideas about creating the gears and other whatnots. I just hope you are okay with it? I am, but it would be a trial category of its own. But this sounds like something that basically possible already. Double check the original post to confirm this. If there’s something that’s not already possible please point that out to me so I can make it official to the “Lost Trials” setup. Name : Wolfgang; Leader of the Werewolves. Upon stepping into the Lost Ruins' Wolf Zone, combat is instantly initiated, against the leader of the werewolves. You must defeat Wolf-Gang to advance. At this point the idea of exhaustion vaguely seems irrelevant. While I can carry on even through what would seem like the worst of storms, a great enough effort will surely stop me. One might say that as a Grandmaster at this level, I have ascended to a different plane altogether. My grasp of the art's theory and its application is as instinctive as breathing. My body moves as needed or desired without thought, leaving the full power of my mind to plot a course of action ... or consider what to have for dinner, if the opponent is sufficiently below my level. My control of force is such that an opponent might not even feel the strike that injured them, or be left wondering how a graze on one side blew a hole in the other. Every apparent opening is a gambit. Every technique leads to a branching variety of others as if leading the opponent in a dance. And of course, I could probably win multiple bar fights in while sitting comfortably at home. Now being recognized as a Grandmaster, I have transcended all formal understandings of speed prior to this level. In fact, the extent of my capabilities is so great that most movements become difficult if not impossible to comprehend without complete focus. I have also been known to be capable of creating at most 5 clones of myself at once. These clones are indistinguishable from the my true self and mimic my movements, but they do not last long. Wolfgang can release claw shaped energy by swinging forth his arm. Releasing the "Bind of the forest", he sees everyone as an enemy. This converts a large amount of energy into rage and fueling him more. This increases his speed and strength. User can send forth/summon phantom wolves of varying sizes.These wolves are quite fast and strong, however, they are noticeably fragile. There's a special set of four giant wolves. A standard wolf has C-Speed, Strength and D+ durability. The special set possesses A+-Speed, S-strength and B-durability. Within a certain plane in the ruin dimension, a large spatial realm known as Berserker domain could be found. Adventurers that trespassed closed to the spatial coordinate of the realm will be pulled or get drawn by the chaotic spatial force and find themselves in the spatial realm of the Berserker’s Domain. Woe to those that aren’t strong enough to survive against the monsters of the realm and fortuitous opportunity will be grabbed by the strong that can conquer the monsters of the realm. Adventurers should note that any of the monsters can decide to appear in any of the spacious floors of the mansion. Only in this way their fate can be decided. Profile (Description/details/backstory) :Berserker is a transcendent being and deity, a monster that has gained human form and intelligence after undergoing evolution in the spatial realm. As the overlord of the Berserker’s domain, he is above captain level in terms of battle capabilities and combat power and also the strongest monster in there. The Berserker is a true master of fire, wind and lightning elements. Well versed in close quarters and gifted with natural durability as a transcendent monster, he possesses a finesse of battle experience that is almost unmatched. Rewards: Those who can defeat the Berserker with Grade A or higher will be granted three marks of heritage in their body. Marks that represent the fire,wind and lighting elements in Japanese kanji. Thus, will be immune to 80% of fire, wind and lighting elemental powers. Getting grade B and defeating the berserker will only grant the adventurer acess to be immune to only one element they desire. Profile (Description/details/backstory): The Qillin is one of the top monsters in the Berserker’s domain, on par with captain level shinigamis…. Blessed with unmatched durability, the Qillin is almost invulnerable to attacks and one of the monsters in there that adventurers had to pay attention to. The Qillin is immune to fire attacks and can burn down all attacks of those weaker than it in terms or reiatsu. The Qillin possess hollow-like battle, combat instincts coupled with massive strength and fire abilities. Though it might be slow in motion but its reaction speed is quite telling and can keep up with shunpo grandmasters for longer periods before tiring. Notable abilities: Can project fire from its mouth, horns and eyes, can freely manipulate fire to any form or shape for attack and defense. Rewards: defeat the Qillin with Grade or higher and get the Qillin horn and shard..
Qillin shard: the skin of a Qillin can be made as an artifact or armour that can increase the user’s durability by one level. Profile (Description/details/backstory):Dao Wen means… the way seeker, seeking the way, seeking the path or the path finder. Though not a monster, Dao wen was an adventurer that seeks his own path in the art of sword. He once wandered into the Berserker’s domain and challenged the Transcendent deity to a bet in battle and having lost the bet, he was forced to become one of the guardians of the realm. Dao wen’s mastery with the sword can be considered matchless and impeccable under heaven, so much that even sword legends can only hope to equal him. Even with his blade sheathed, he can match grandmasters swordsman for longer periods of time. Blessed with great strength and reaction speed that can perceive the motions of shunpo masters, Dao wen is not just a simple fighter, he normally refers to himself as Venerable when engaging himself in discussions. Rewards; Defeat Dao Wen with Grade A or higher and get his yin-yang sword. 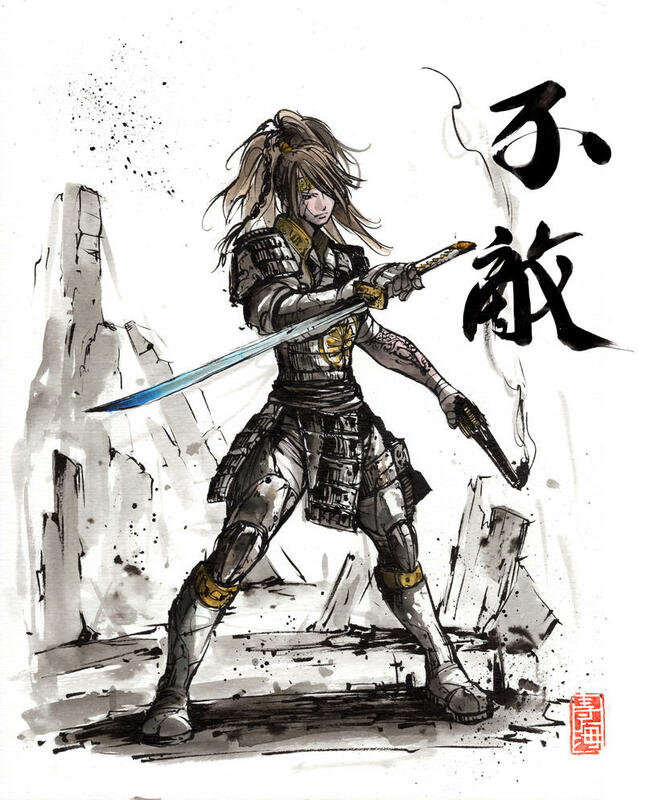 Yin-Yang sword: The sword of Dao Wen possess the abilities to strike multiple places at once when applied in combat i.e with one slash from the sword, five illusory slashes will find their way to the target. Even though it’s illusory, the damage are not. In a sense, one slash gives birth to five and two slashes gives birth to ten. However, when used in combat, the user can’t unleash bankai ever for one day. Also, using one slash each takes 10% of the users reiatsu. The berseker's domain is what i have been working on. For now, i still have thoughts to improve berseker's innate ability and some tempting rewards. Even the qillin needs improvement as well. Hi, hello. It me. I forgot to list Hakuda for the monster stats. If you would be so kind as to include that where’s it applies that’d be great. Thanks all, sorry for bein a goof. I added it long before. I knew you made you mistake. Anyway, I'm using the CBS system but I removed the unnecessary stats. You can check above to see. The NPC/Monster Builder is now complete. The way NPCs and monsters work in comparison to normal characters is a lil different. For Starters, all their stats start at D level. They have all the same stats besides Reiatsu, Reiatsu Control, and Zanpakutou mastery. Their reiatsu amount is to be considered infinite, and their control is to be considered perfect (where applicable). Because of these changes, their maximum level is 60. To calculate their stats please use the following. Additionally Monsters and NPCs can only have a total of 4 abilities. However, these abilities are to be considered perfectly mastered. First and foremost, Emi is incredibly stubborn. The concept of giving up simply isn’t an option with her. Even if she must relent for a moment, her goals and her way ever remain at the forefront of her thoughts. As such, her insistence on reaching her goals can only ever be delayed. Aside from that, Emi aims to keep a positive attitudes, even despite past tragedies, Emi usually comes off as cherry and is willing to at least fake it if that means making them seem a lot better than what they actually are. Finally, Emi is compassionate has has a strong sense of justice. She’s quick to sympathize with those in need or suffering in any way, as well as committing herself to doing what’s right as much as humanly possible. As a result however, her strong sense of justice can and often does lead her to obsess about doing what’s right at the end of the day. As a casual user of this art, I have learned enough of the basics to use it in instances where I lack a weapon. My techniques have power, accuracy and balance, but I still lack confidence in my skill, so application is likely to be unimaginative and cautious. I will miss openings and am likely to be drawn in by a gambit. I am not the most likely to engage in hand-to-hand combat, but it is a valid option if absolutely necessary. An attack designed for the sole purpose of cutting an enemy down at close range (2m). As a result of any of the user’s slashing attacks done while calling out the word “Suimei”, a trail of hundreds of smaller slashing blades known as hakaze (刃風, blade wind) is formed. Upon manifestation, the mass of small blades appears like sunlight reflecting off gentle waters. An attack purely steeped in the art of deception. When the user attacks and calls out “Anbu Zangeki”, a phantom hand appears and quickly draws an ephemeral blade to make its attack. Upon manifestation, appears as if death itself is seeking to claim the life of its victims. After gaining Sen, the user draws on the full power of the blade. Making use of this power, they cut into or at the earth while calling “Chikyuu Zangeki” to cause an upheaval. Upon upheaval, it appears as if a dragon sleeping beneath the earth is awakening with righteous fury. After gaining Sen, the user draws on the true power of the blade by consuming it and increasing the strength of their voice. In response to the user’s strengthened voice, Reijin works harder and the potential any techniques used thereafter is increased. However doing so results in dissonance, thus preventing additional resonance for a short time. Additionally the use of this power strains the user’s voice, preventing them from using it for a short period of time. As such, techniques requiring their name to be called, including Kidou, cannot be used during this time. I might be making a few further adjustments to the layout but as of right now what's in the spoiler is how it looks. @konami31 I won’t be reviewing items and such until the end, furthermore you shouldn’t set your stats up to go beyond what’s listed in the CBS. I also need to point out that you should avoid listing any specific rewards at this time as rewards will primarily be monster abilities. Please refer to the original post for details regarding this. While other types of rewards will be allowed it will only be in specific circumstances after my approval, which will not come at this time. Finally I’ll be (soft) deleting your previous post as monster should be placed in the appropriate thread from now on. You’ll still be able to see it and copy what’s there however.